It began when he first tried the sport at age 12 in his hometown of Khmelnitsky, Ukraine. 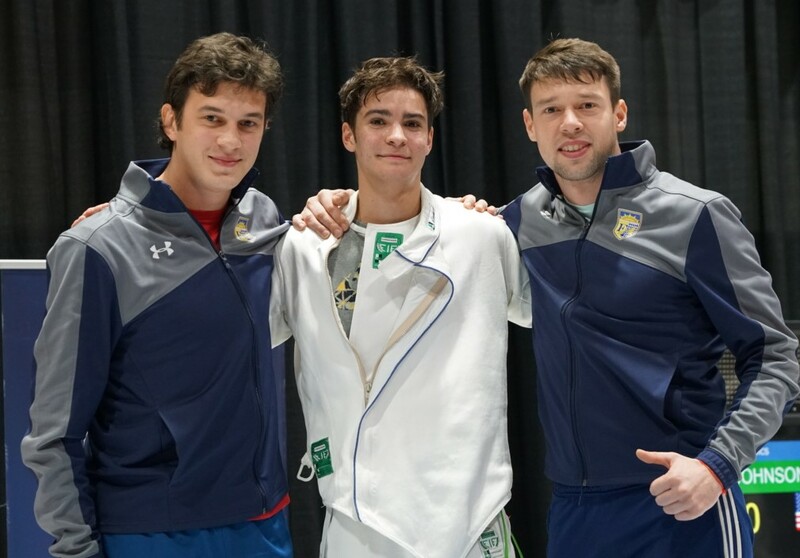 That love led him to a silver medal in the Ukraine National Championship, to travel to the United States to fence for St. John’s University, and then to open a fencing academy in Brooklyn and now, Port Washington. Mokretsov said he played basketball and danced when he was younger, but was drawn to fencing by its mental component and the variety of outcomes. For several years as a teenager, Mokretsov was a member of Ukraine’s national team, competing in tournaments around Europe and the world. He was a finalist in the European Championship team event in 2004. In 2006, he left Ukraine for the United States, where he had received a scholarship to fence for St. John’s University. At St. John’s, he earned All-American honors in 2008 and served as team captain and manager. 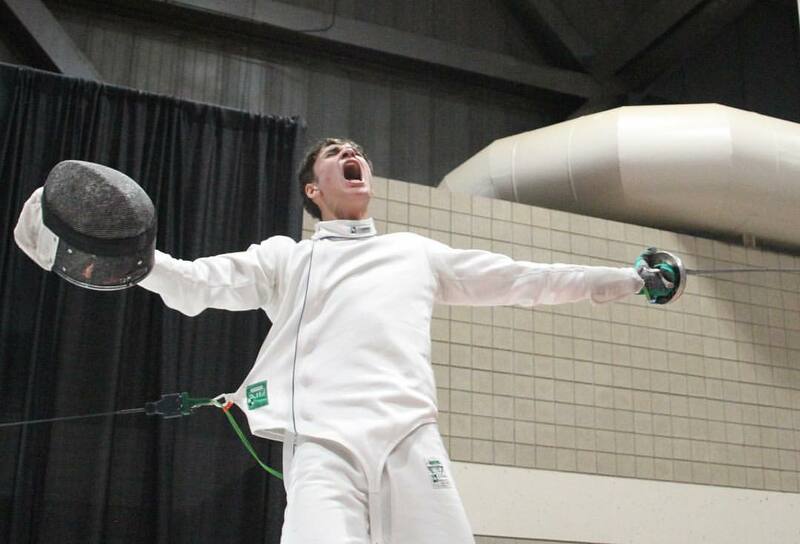 Fencing dominated his life, and so he was unsure what to do when he graduated in 2010. The economy was in the midst of a recession and jobs were hard to find. He had already spent the previous four years volunteering as a fencing coach, so he decided to open New York Fencing Academy in Brooklyn. Mokretsov’s students, many of whom he has coached since they were 9, have won medals around the world. Speaking in his empty Port Washington studio a week before it was set to open, he mentioned that he had just returned with some of his students from a world championship in Italy. As to why he had chosen Port Washington for his second location, Mokretsov said he wanted to have another practice space closer to some of his students, and he had many in the Port Washington area. “We have many students coming from Long Island, and it is hard for them to train at a high level if they can only come on weekends,” he said. Students as young as 6 can join the Fencing Academy. Mokretsov said he starts off by teaching them positions and how to hold the weapon, and recommends that students take four private lessons before taking the group classes. “For the kids, it’s fun because you get to use a weapon,” he said, and then noted that fencing was one of the safest sports to play. Even though most of his students are younger, Mokretsov said one of his favorite things about fencing is that it is a sport you can participate in, and get better at, regardless of age and body type. BROOKLYN – A fencer who grew up in Brooklyn is hoping that he’ll make it to the Olympics in 2020. Alan Temiryaev, 17, won the Junior Olympics last year and is heading back for round two this weekend. He trains in Brighton Beach for about four hours, five to six days a week. “Sometimes I’ll take Wednesdays off to just relax, get myself together, focus on studies and tests and then Sundays I usually have off. But every other day I come here,” he says. A high school junior, Temiryaev is also working to get accepted to Columbia University. Victory moment for 16-year-old Alan Temiryaev. 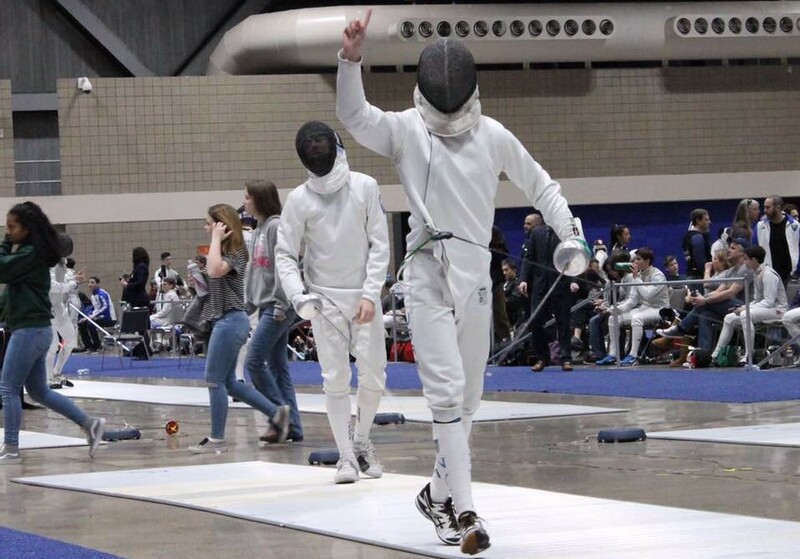 A disciplined but fun-loving sophomore at James Madison High School is setting records for fencing and laser-sharp focus — from the fencing academy in Coney Island to championships around the world. In February, Alan Temiryaev, back from a debilitating knee injury, nabbed the Gold in the Junior Olympics in a spectacular and dramatic bout. And at 16 years old, he is one of the youngest to win the Junior (under-20) age category, beating out 301 competitors this year. Temiryaev started off this bout losing and couldn’t catch up — until the very last moment. With just 20 seconds left and trailing 4-6, Temiryaev pulled out his skillful combination of touches and a unique perseverance and won in overtime seconds with a score of 7–6. And Temiryaev was flying solo, since the final bout took place far from the coaches seating area. “The students cannot hear and you can coach only in the break. He was on his own. It was his own willpower,” he said. Temiryaev has been fencing since he was 10 years old, under the tutelage of Coach Misha Mokretsov of Coney Island’s New York Fencing Academy. Coach Mokretsov saw something special in Temiryaev right away, he said. 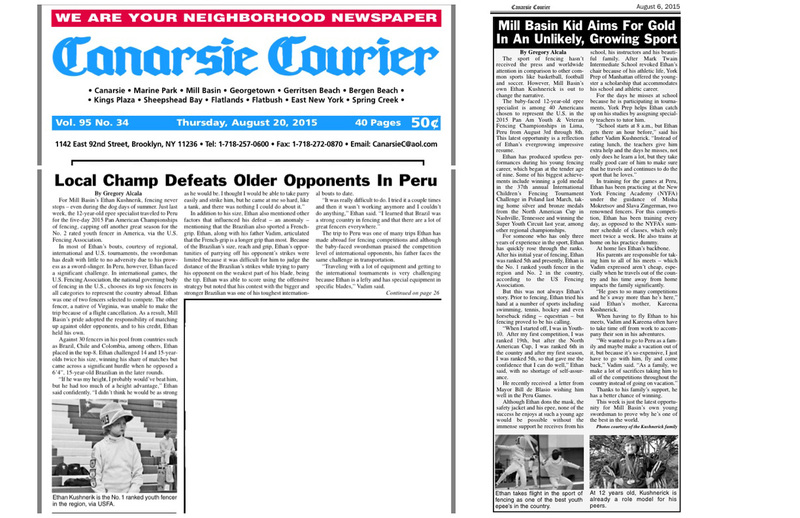 “He started like a regular kid, but in little less than a year he got second place at Summer Nationals for 10 and younger — which was surprising because he was a beginner,” said Mokretsov, whose Coney Island-based fencing academy (NYFA) has one of the strongest competitive epee programs in the country. He attributes some of that to technique and skill, but even more so to mental strength. “He managed to overcome pressure and scored complex actions, which requires fine execution and takes a lot of courage — even without pressure,” said Mokretsov. “I’ve been coaching for 10 years and have had a lot of good kids,” said Mokretsov. “But usually they are tense when it comes to close bouts. But Alan does better under pressure. That’s what makes him unique. Many people can have a good day when it’s easy, but when you’re not having a good day — which happens a lot in our sport — it’s psychological, and opponent matches play a big role,” he said. Next, Temiryaev will travel with his coach, Misha Mokretsov, to compete at the World Championships in Bulgaria in April. (Colorado Springs, Colo.) – Team USA’s men claimed five of the seven medals and Chloe Daniel (Sierra Madre, Calif.) won bronze at the Epee Cadet European Cup on Saturday in Klagenfurt, Austria. Ryan Griffiths (Fairlawn, N.J.) earned the individual gold medal in Klagenfurt for the second consecutive year while Alan Temiryaev (Brooklyn, N.Y.) grabbed a spot on the podium with a bronze at his first international competition. In the men’s team competition, the Americans swept the podium, its four teams placing in the top four spots. For Griffiths, a gold in the team event marked his second title of the day; Temiryaev also brings home a pair of medals, adding a second bronze from the team event to his collection. Team USA started the day strong in the men’s individual competition with nine members going undefeated in the pool rounds and the U.S. securing four of the top five seeds in the direct elimination rounds. Griffiths was one of the Americans to finish 6-0 in pools, taking the eighth seed and receiving a bye into the table of 128, where he defeated Alexandre Hungerbuehler (GER), 15-12. He then cruised through the next two rounds, besting Ruslan Hasanov (UKR), 15-6, and Fynn Fafard (CAN), 15-8. To secure a place in the quarterfinals, Griffiths overcame Alex Oroian (ROU), 15-11. In quarters and semis, Griffiths would have to beat two of his teammates, securing a medal with a 15-12 victory over teammate Eliot Herbst (Houston, Texas) and reaching the final with a 15-13 win over Temiryaev. Once in the final, Griffiths took control, winning the bout 15-9 over Daniel Hosszu (HUN). On his way to his first international medal, Temiryaev found his stride with a 15-6 victory over Zachary Jaccoud (SUI) in the 128 before defeating Bartlomiej Zbierada (POL), 15-12. In the table of 32, Temiryaev out-touched Samu Szlachanyi (HUN), 15-14, pitting him against teammate Theodore Lombardo (Mount Kisco, N.Y.) in the 16. Temiryaev once again squeaked out the victory, winning the bout 8-7. In the quarters, Temiryaev held off Ian Hauri (SUI), 14-12, before giving Griffiths his closest bout of the day. Team USA made up half the competitors in the table of 16 as Herbst, Emon Daroian (Encino, Calif.), Jonathan Piskovatskov (Houston, Texas), Cedric Mecke (New York, N.Y.), Lombardo and Robert Hondor (Malden, Mass.) joined Griffiths and Temiryaev in the 16. Herbst and Daroian advanced to the quarterfinals, finishing in fifth and seventh, respectively. In the Cadet Point Standings, Griffiths maintains his No. 1 ranking, holding a 300-point lead over Piskovatskov. Temiryaev climbed into the third spot with Lombardo just 30 points behind. In the women’s competition, Daniel defeated two fencers from Great Britain in her first two DEs, outscoring Charlotte Summers 15-11 in the table of 128 and Laura Sheffield 15-12 in the 64. After advancing to the 16 with a 15-8 victory over Anna Musial (POL), Daniel overcame the No. 4 fencer in the European Cadet rankings, Zsuzsa Schlier (ROU), 15-12. Daniel then beat Natasha Kis-Toth (CAN), 15-13, in the quarterfinals, but missed a chance at gold with a 15-9 loss to Renata Petri (HUN). The podium finish at her first international competition of the year allowed Daniel to jump three spots in the Cadet Point Standings to No. 2. Greta Candreva (Katonah, N.Y.) holds the top spot while Ariana Mangano (Colts Neck, N.J.) and Sofia Komar (Laurence Harbor, N.J.) currently rank third and fourth. Komar also finished in the top 16, controlling her table of 128 bout against Alessandra Luna (SUI), 15-7. In the next two rounds, Komar ended the day of two teammates, claiming victories over Amanda Pirkowski (Longwood, Fla.), 15-8, and Emily Vermeule (Cambridge, Mass. ), 15-11. A loss to Edina Kardos (HUN) in the 16 led to a 13th place finish. The team competition saw the U.S. men dominate the competition as all four teams secured spots in the semifinals. In the first semifinal, USA 1, featuring Griffiths, Lombardo, Piskovatskov and Wolfe Crouse (Conroe, Texas), narrowly defeated USA 2, composed of Temiryaev, Anton Chmut (Brooklyn, N.Y.), Isaac Herbst (Houston, Texas) and Cedric Mecke (New York, N.Y.) USA 1 jumped out to an early lead and despite a comeback from USA 2, held on to win 35-33. USA 3, which included Michael Bissinger (Houston, Texas), Eliot Herbst, Daroian and Kevin Chao (Manhattan Beach, Calif.), and USA 4, containing Thomas Etchell (Greenwood Village, Colo.), Timothy Frank (Portland, Ore.) and Nathan Vaysberg (Brooklyn, N.Y.) squared off in the second semifinal. USA 3 won seven of the nine bouts for a 45-33 victory. In the final, USA 1 overcame a 20-18 deficit to win 45-41 for the gold. In the bronze medal match, Isaac Herbst won the fourth round 6-1 to break a 14-14 tie and USA 2 went on to win 45-38. In the women’s team event, Komar and Mangano fenced on USA 1 with Karolina Nixon (Los Angeles, Calif.) and Miriam Grady (Broomfield, Colo.) The Americans first dominated Poland, 45-19 in the table of 32 before besting USA 3, 38-35. The quarterfinals featured a come-from-behind victory as Komar won her anchor bout 11-4, overcoming Romania’s six-point lead to win by a touch, 42-41. However, USA 1 came up short of a medal, falling in the semi to Estonia, 45-34, and Hungary 2, 45-36, in the bronze medal match.